The U.N. operates on very strange logic. That somehow a democracy of unfree countries voting -- one vote for each country -- produces a result that has something to do with the value of freedom. Following the U.N. General Assembly vote condemning the United States' recognition of Jerusalem as the capital of Israel, and Ambassador Nikki Haley's bold speech to that body following the vote, Haley has announced that the 2018 budget for the U.N. will be cut by $285 million. So $285 million is not a game-changing sum. But this is a significant step to put the U.N. — and the world — on notice that President Donald Trump means what he says. "We will no longer let the generosity of the American people be taken advantage of or remain unchecked," said Haley. One hundred and twenty-eight nations in the General Assembly voted to condemn and annul the U.S. decision on Jerusalem and only nine voted to support the United States. As Haley pointed out, this vote had implications beyond this one, albeit critically important, issue. It was about American values, the coincidence of American values with the United States' support of Israel, and a reassessment of the United States' role in the U.N. The United States and Israel stand for the "ideals of human freedom and dignity that the United Nations is supposed to be about," said Ambassador Haley. Looking at the particular realities of the U.N., it's hard to see coincidence between these American values and what is going on there. It's somewhat akin to trial by jury where most of the jurors are convicted criminals. What, after all, can be the meaning of despotic nations like North Korea, Cuba, Syria, Iran and Venezuela voting to express their opinion of the legitimacy of the United States recognizing Jerusalem as Israel's capital? 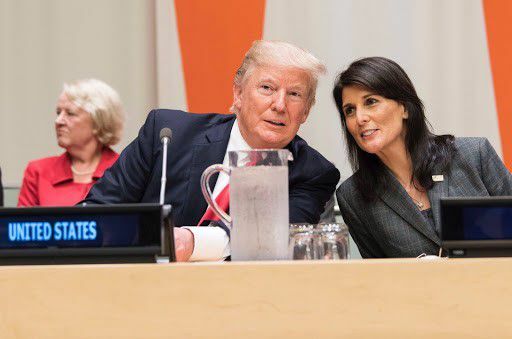 Why should the United States continue to be the largest contributor to the U.N. for what Haley called the "dubious distinction" of being disrespected and having its values flouted? A few days before the U.N. vote, Trump gave a speech at the Reagan Building in Washington defining his National Security Strategy. He stated that "a nation that is not certain of its values cannot summon the will to defend them." As we enter the new year, Americans should feel pride and optimism that, at last, it appears we have an American administration that is certain of our values — human freedom and dignity as stated by Nikki Haley — and is ready to boldly demonstrate the "will to defend" these values. It's about time the United States is getting real about the United Nations. President Trump should get high-fives for his leadership.